← Will Hamiltonians finally get a voice on fluoridation? Anti-fluoridation activists often assure us that fluorine (F) is not an essential element. But what does that mean? Literally I guess it means that there are no identified biological pathways essential to human life involving F. So anti-fluoridation activists often claim the only safe level of flourine in the human diet is zero! But whether an element is essential or not is often unclear or undecided. Some sources claim about 16 elements seem to be essential to maintain life. Others claim over 20 elements are essential. So F may well be considered an essential trace element, or a beneficial element. By the way, we should not let the fact that F is known to have harmful effects when in excess lead us to deny its beneficial effects. Probably all essential or beneficial elements and trace elements do. Essential and beneficial elements usually display a “beneficial window” of intake. This can be shown by a U shaped graph when we plot the incidence of negative effects against intake (see figure below). Source: Howd & Fan, 2007 – Risk Assessment for Chemicals in Drinking Water page 202. So we expect to see that sort of relationship with F intake if the element is essential, or even just beneficial. If there are no benefits from F we would expect only an increasing incidence of negative effects when the intake increases from zero. Of course we also see that for essential or beneficial elements if we restrict our data to only high levels of intake. Does F have benefits besides dental ones? Do the benefits of F extend more widely than the prevention of dental cavities? I have often thought they do because F has a clear effect on the structure and solubility of hydroxyapatites – an important and major componet of bones. A small amount of substitution of F for OH in the hydroxyapatite structure can strengthen such minerals and lower their solubility. Bioapatites are a major component of our skeletons, and play a role in many of our organs. This chemical substitution may actually have positive effects on bone health, and the properties of other bioapatites. Of course excessive substitution, or differentiation into different chemical crystalline phases, may also have negative effects when there is excessive intake. 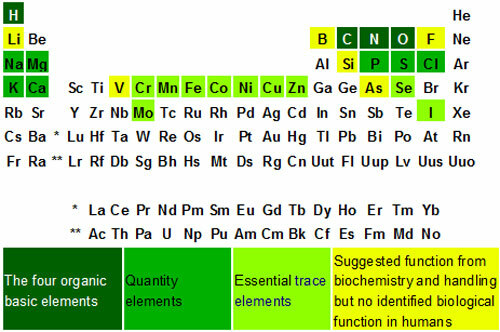 By the way, F is not the only elements that substitutes at trace levels in bioapatites. There are many more and they can each influence the properties of the bioapatite. Another way of looking at this is that pure chemically defined compounds rarely exist in the real world. Other minor elements are often incorporated into the crystal structure, or be present in a closely associated crystal phase. These “impurities” or substituted elements usually impart features to the natural material which are greater or lesser than, or perhaps not even seen, in the pure compound. These features can be important to the biological role of crystals in nature and life. Beneficial effects of F on human bones? I recently checked out a paper which shows beneficial effects of F on human bones along the lines I have suggested. 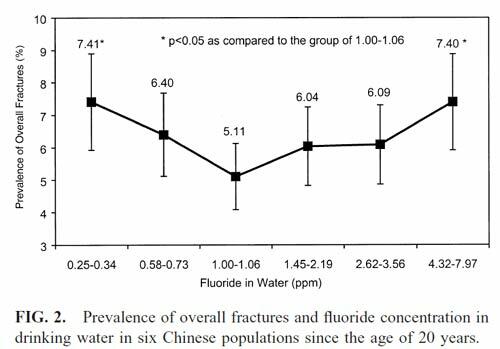 The paper is Yiming Li et al., (2001): Effect of Long-Term Exposure to Fluoride in Drinking Water on Risks of Bone Fractures. The authors are a group of researchers from the US and China. You can download the PDF here and check out methodology and other details. Here’s one of the figures from their paper summarising the relationship of overall bone fractures to F content of the water supply used. Effectively, this displays the U-shaped curve mentioned for essential elements in Risk Assessment for Chemicals in Drinking Water. Or, perhaps more importantly – statistically significant increases in numbers of bone fractures occur at both low levels of fluoride in drinking water (<0.3 ppm) and at high levels (>4 ppm). Not surprisingly this window corresponds approximately to current New Zealand advice for oral health – concentrations of fluoride in the water supply in the range 0.7 to 1.0 ppm are beneficial. So perhaps we should consider F as an essential, or at least, beneficial trace element as Wikipedia suggests. And perhaps health authorities in New Zealand should include bone health, together with oral health, in their advice on fluoridation. Other groups have produced similar conclusions to that of Yiming Li et al. – particularly that the incidence of bone fractures are reduced by fluoride doses in the beneficial range of F intake. But, these sort of investigations are very complex so it’s possible to find other studies which don’t show this result, or show only the effects of high fluoride intake. This raises the question of the quality of such investigations and the need for readers and reviewers to be particularly informed about such issues. Many of these sorts of studies produce results of questionable quality because they ignore the role of other factors besides F in the water supply. For example, in many developed countries, and many developing ones, dietary intake of fluoride also comes from toothpaste, mouthrinses and dietary supplements. The high mobility of modern populations also makes it difficult to relate clinical effects to simple factors in the current environment of the individuals. It’s no wonder that attempts to relate health effects to fluoride concentrations in the public water supply produces controversial findings. Mind you, that’s a great gift to the unscrupulous cherry-picking, uncritical reviewer with an ideological or activist axe to grind. If you are selecting studies to support a preconceived viewpoint the influence of other factors is not important – you just choose what suits your argument and ignore the quality. But if you are trying to establish a reliable picture of what is actually happening, as we hope our health professionals and scientists are, it’s important to consider the quality, and reliability, of each study. This sort of reliability of information is just not available for modern populations in most countries, making these sort of studies unreliable. The lesson here is that there must employ intelligent and expert consideration when reading or reviewing research in this sort of area. People consulting such studies and reviews should also be aware of the dangers. When public debates, like that over fluoridation, occur we need to be aware of the way activists may draw unreliable conclusions from the literature and promote those unreliable conclusions to the public. As an aside – this study also considered possible effects of factors like gender, smoking and alcohol – not surprisingly bone fracture were higher for men, and for those consuming alcohol! So, is fluoride an essential element? I don’t know and I am hardly the person to decide. But clearly it is possible to argue the case that it may be, or that it is at least a beneficial element, provided dietary intake is neither too low or too high. It’s a complex area – just beware of activists with an axe to grind and a simple picture to support their claims. This entry was posted in SciBlogs, science, Science and Society and tagged Bone fracture, Dental caries, Dietary mineral, fluoridation, Fluorine, SciBlogs, Trace element. Bookmark the permalink. Ken, on other posts you’ve been claiming Fl is an essential element. Here you claim you don’t know. So for member of the Objective Skeptics Society, all you have to do is believe that Fluoride is an essential element and it is! See, miracles do happen. There is a big difference between essential and beneficial. Your argument would be more receptive if you dropped trying to push the term essential, and focussed on the term beneficial. The question then is one of degrees. For example, Bull Sh!# is beneficial to a vege patch, but not essential. The article is a constructive one… but it would have benefited from using the word beneficial, rather than essential, in the header. OK Ron, please quote my articles where you claim I assert that F is an “essential” element. Yes, I know, you can’t because I haven’t. I have just raised the possibility because of the role F plays in bioapatites. It is those who dogmatically claim F is not essential who should be criticised – science is never that settled. And, yes, you have made that dogmatic claim. The Wikipedia article even suggested that because of that F should be considered an essential trace element. Because of the vagueness of the term I have always preferred “beneficial” for F – I don’t think that can be doubted. Although I really question what life would be like for a mammal like us completely free of F.
What the hell is the Objective Skeptics Society you refer to – never heard of it, I am not a joiner of most things, and if you have been reading my posts you would note I have been critical of so-called skeptics – a couple of posts even caused a bit of a debate between me and local skeptics. But you seem to have a hang up about skeptics – do they support fluoridation? Christ, you are scrapping the barrel aren’t you to be so picky of titles. I see nothing wrong with it, I posed the question, explained it and, I think, have a useful explanation of why F should be considered beneficial quite apart from dental effects. And I notice you don’t seem to be able to question any of the material used, including my comments on the need for intelligent and critical reading of such research and noting that anti-fluoridation activists are not. A rather waste of a comment. Change your focus… use the argument ‘beneficial’ and then you’ll be arguing on relatively safe ground. But look at how dogmatism effects some people. Science is never settled, Ron. What’s happened to common civility? A gentleman apologises when they have been caught out like that. In other words, they have redefined the term essential to mean whatever they want it to mean. The word essential means, well, essential… it doesn’t simply mean, ‘optional extra’ or ‘would be nice’ it means essential. Bull Sh!# it’s essential for growing cabbages, but in my experience it sure is beneficial. As a fully paid up member of the Objective Skeptics Society, I would have thought you would stick to science and fact. And you, Ron, have defined it rigidly to mean what you want it to mean – bugger the evidence or new discoveries. Christ, what a waste of electrons and time. Can’t you find anything better to do on a wet Sunday? Ken says that Science is never settled. If the term essential nutrient can be defined however one wants to define it, then surely others can define the term toxic element in whatever terms they want. Personally, I don’t agree with either extreme… it appears you do… I guess that’s a key tenet of the belief system of paid up members of the Objective Skeptics Society. How ironic. I wonder how long before Gluckman is shamed into clarifying the misunderstanding created by his murky press release. He’s supposed to be the master communicator of science… in which case his muddying of the water appears to have been deliberate. toxic substances in its fluid mix such as lead, arsenic, mercury, and usually contains any or all of the following substances as well: cadmium, selenium, radium, radon, polonium, radioactive uranium 238, mercury, chromium and phosphorus. That’s what you are swallowing with every glass of water that you drink. Is that then really a healthy drink? I don’t think so! What people are not looking at are all the negative effects from ingesting this toxic wastes. Fluoride & Intelligence: 37 of the 43 human studies have found that elevated fluoride exposure is associated with reduced IQ. Prolonged, excessive exposure to fluoride can cause a debilitating bone disease known as skeletal fluorosis. I have to ask everyone “does the sole benefit outweigh all the risk”. Tooth Decay in F vs. NF Countries: See World Health Organization data showing tooth decay rates have declined at the same steep rate in non-fluoridated countries, as they have in fluoridated countries. I could go on, but I think I made my point. I just hope that the person running this site is fair and will post this. algiistd – nothing in your comment is at all new and most of it is misinterpreted by you. Have a look at my articles on fluoridation which will answer most of the issues you raised. Also have a look at the debate I am currently having with Paul Connett, a well known US anti-fluoridationist6. We are thrashing out many of these issues and it is ongoing. By the way – I notice most of your links are to Fluoride Alert articles. This is a thoroughly unreliable site for information on the issue. Most of the material they post is misleading. 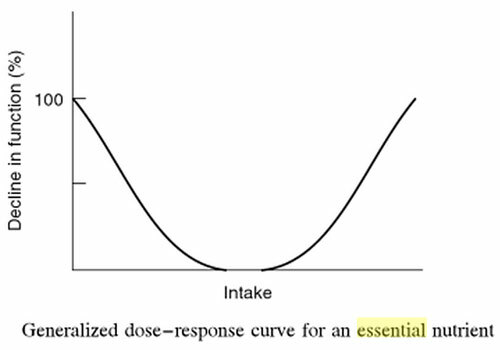 How do the anti-F people get from ‘not essential’ to ‘only safe level is zero’? There are plenty of things we ingest that are not essential but which are safe at levels far, far above zero. There are no substances for which the only safe level is zero. Well, it is a bit like the people who say that there is no safe level for nuclear power, fracking, gmo etc. If they take that stand on nuclear power, when are they leaving the solar system? After all, there’s a big old nuclear reactor right in the middle of it. I think you have a point there Rosalind. Eventually the NZ Green Party will reconnect with the mothership and depart for another Galaxy. If you, like me, have spent a lot of time wondering where this loon stuff comes from? Well, in the age of the Internet madness knows no boundaries. Look at this discussion on the loony right in the US where as we know a lot of the anti F hysteria originates. up and make them hallucinate. Most of these characters NEVER explore alternative channels of information. I mean reliable channels. They are so obsessed with propping up their delusions they will grasp at any straw or indulge in the most rediculous semantics to stay afloat. We know this is an echo chamber effect because we see the same phrases and “references” cropping up again and again. It’s like a fingerprint really. Frankly I think scientists are just far too polite to them. A lot of this rubbish comes from quite inadequate types parading an online pseudo intellectual persona (avatar). The only reason I continue to stick it to them is their “concern for human welfare” is completely fraudulent. There are others of course are just simply uninformed and misguided. I saw one the other day where a women imperiously demanded “proof” that flouride is good for oral health. She just has no idea of the work that has gone into this subject. Yet they have the temerity and arrogance to think their casual dabbling in the subject challenges the work of vast numbers of scientists and health workers. One (deluded) exception wins the argument they think. Where do people like Jon come from? It’s an endless parade of illiterate morons. Learn to spell. Learn basic grammar. Then try your luck posting on the internet. I don’t mean to sound cruel but, seriously, why are all of you doing this? Why do you hate the English language so very much? Get an education. Go back to school. Take your meds. Anything!